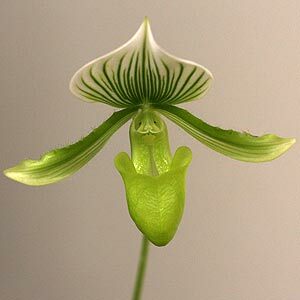 Paphiopedilum Orchid species ‘Slipper Orchids’ or ‘Paphs’ are originally from South China , India and Southeast Asia with unusual flowers they are sometimes called ‘lady slippers’. A well lit situation but avoiding full sun. Use a good orchid growing mix, some growers place pots on trays of pebbles sitting in water to help maintain humidity. 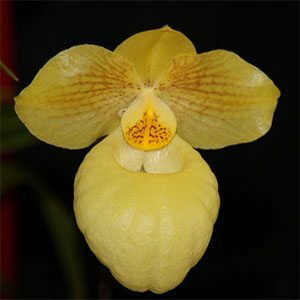 The many Paphiopedilum hybrids available for sale fall into a number of categories and these are a little confusing as different growers and even some orchid societies seem to use different terms. Plants that are a cross between two different species are perhaps the easiest to deal with, these are sometimes referred to as a ‘primary cross’ or ‘first cross’ after this the world of hybridisation becomes a little murky to any but the specialist. Paphiopedilum maudiae is perhaps the best known hybrid of all, it is a cross between the two species Paph . callosum sanderae x Paph. lawrenceanum hyeanum and this was back in the late 1890s. P.micranthum is a much sought after species. Pictured right is Paphiopedilum maudiae magnificum, large flowers and one of the best green and white Paphs going around. A fairly good grower and actually very nice mottled foliage as well. Constant moisture, but not water logged is the key, bright filtered light is the best, they will even grow on a windowsill, but not direct sun. The temperature is the tricky part, some are cool growing, other like warmth, so ask questions when buying. Best grown in a glasshouse with 50 – 75 % shade depending on your climate, the hotter, the heavier shade. Use a pine bark potting medium, it works well with Paphs. Repot every two years to refresh the potting mix, this ensures that salt build up is removed and the potting mix that is beginning to break down and slow drainage is replaced. Fertilize regularly with a weak fertilizer rather than all at once with a strong one. Best to fertilize more when in active growth and cut back over winter, however in warmer climates they will grow a little over winter as well. 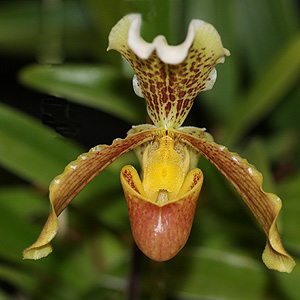 Rare orchid species and select hybrids. African species. Bulbophyllums. Lycastes. Paphiopedilums. Dendrochilums. Gongoras. Aerangis. Stanhopea and much more. So why do the Paphs, or ‘Slipper Orchids make such good house plants ? They like low light, warmth and with some moisture and indirect light near a window they do well. Yes they will do better in a greenhouse, but not everyone can do this. P. rothschildianum is more well know, in fact it is commonly called the ‘King of Paphs’, large flowers and again from Borneo. P.insigne is from Northern India through to the Himalayas, a cooler growing species and a little easier for most home growers. More than One Slipper Orchid Species. Paphiopedilum (These grow as terrestrial, epiphytic and lithophytic and are found across Asia).